Seattle Pain Centers’ former patients are struggling to find new providers after state action against medical director Dr. Frank Li. Officials are trying to absorb at least 8,000 patients prescribed opioid painkillers this year. The calls are coming, angry and anxious, from pain patients across Washington worried they can’t find care. Three weeks after state officials suspended the medical license of Dr. Frank Li, medical director of Seattle Pain Centers, citing allegations of billing fraud and possibly contributing to patient deaths, other providers say they’ve been swamped with a new — and desperate — demand. “We’ve had hundreds of patients who have been referred to us already,” said Dr. David J. Tauben, the chief of pain medicine at the University of Washington. 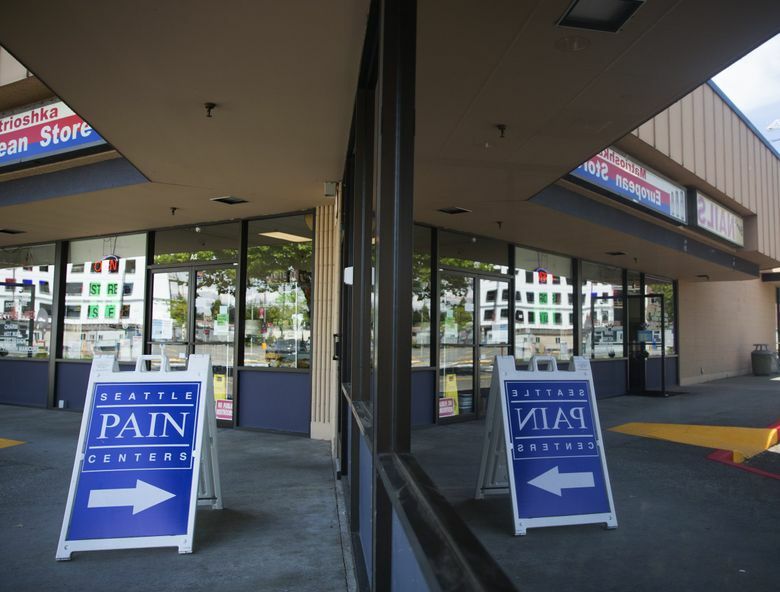 Seattle Pain Centers patients should seek advice from their primary-care providers and insurance plans about finding a new source of pain management, officials said Thursday. Call the Washington Recovery Help Line at 1-866-789-1511, or visit warecoveryhelpline.org. •UW Medicine, uwmedicine.org/services/pain, or 206-598-4282. •Swedish Pain Services, swedish.org/services.pain-services, or 206-386-2013. •The Washington Center for Pain Management, washingtonpain.com or 425-774-1538. It’s the same story at Swedish Medical Center, where Dr. Steven Stanos is the medical director for Pain Services. At the Washington Center for Pain Management, which has clinics here and in Oregon, staff have been fielding at least 200 calls a day. “We’re absorbing quite a few of them,” said Jae Lee, chief executive of the operation. But finding enough places to accept more than 8,000 Seattle Pain Centers patients prescribed opiates this year — and an estimated 25,000 who have received care overall — is a challenge. Li has not been charged with a crime. He has requested a hearing regarding the charges brought by the Medical Commission, but no date has been set. Julie Graham, a spokeswoman with the Washington State Department of Health, said the hearing likely will be held in the fall. Particularly vulnerable are an estimated 400 patients who receive pain medications through implanted pumps. If they run out of drugs, they could suffer severe withdrawal, or die, doctors said. “This pain pump has been a godsend,” said Maria Halinen, 72, of Tacoma. Her 71-year-old husband, Martti Halinen, has used pumps filled with hydromorphone for nearly 20 years to help quell the pain of arachnoiditis, which causes debilitating inflammation of one of the linings of the brain and spinal cord. They say they always liked Li and are distraught at the closure of his clinics. “If his medication runs out, Martti says it will be like waiting for someone to beat you up, the pain will be so bad,” Maria Halinen said. Seattle Pain Centers previously operated eight clinics across Washington. As of this month, only the Renton site remains open, state officials said. Other providers of pain care were taken by surprise when the Washington Medical Commission suspended Li’s license July 14 and took action against more than 40 other providers who worked for his clinics since 2013. The state Health Care Authority (HCA), which oversees Medicaid, also revoked his ability to bill for services. It’s especially difficult now, in the middle of summer, when vacations mean staffing levels are lower and trauma incidents — boating and car accidents, among others — are high. State records showed problems with Li’s practice dating to 2013. But health-department officials say they acted quickly to coordinate efforts to offset the impact of the clinic closures. “We are working with HCA to identify resources, gaps and potential short- and longer-term solutions for patients and health-care providers,” said Graham, of the health department. More than 60 providers across Washington called in this week for a telephone conference organized by the health department. The session was closed to reporters. That’s hopeful news for people like Joseph Tade, 54, of Olympia. He was hurt at age 20 in an industrial accident — a transmission fell out of a machine and he caught it, he said. It left him with degenerative disc disease — and chronic back pain. He’s been a patient of Seattle Pain Centers for four years and found out July 27 his clinic was closed. State health officials have set up a patient hotline and urged those who are without care to reach out to the primary-care providers who originally referred them to Li’s centers. UW Medicine and Swedish pain-management officials say they’ll take responsibility for the patients already in their system. Whether they will accept new patients is a question. “The solution is not running to the University of Washington to get your pain care,” Tauben said. But other primary-care doctors may be reluctant to take on chronic-pain patients who are covered by strict state pain-management rules that took effect in 2012. It’s especially difficult to tackle patients who may be on high doses of painkillers, he said. “Many of them have not been trained and many of them have been terrified that they don’t know how to manage patients above the guidelines,” Tauben said. New guidelines from the Centers for Disease Control and Prevention (CDC) say that doctors should avoid doses higher than 90 milligrams of morphine-equivalent drugs per day — or have a strong justification for their use. State rules require an expert consultation at doses of 120 milligrams of morphine equivalent or higher. Complicating matters, many doctors don’t like to accept Medicaid patients because reimbursement for care is low. “You can’t get a doctor. It’s real hard to get a doctor,” said Pam Rockwood, 67, of Woodinville, who said she was treated at Seattle Pain Centers after her back was injured in three car accidents between 2003 and 2006. Rockwood said she has reached out to a former primary-care provider at UW Medicine and hopes to be seen before her two-month pill supply runs out. In a letter this week to primary-care providers across the state, health officials again urged them to step up to help Seattle Pain Centers patients. “Health practitioners who treat displaced patients should not fear disciplinary action from the state’s Medical Commission for ordering, prescribing, dispensing or administering controlled substances, including opioids, for legitimate medical purposes and in the course of professional practice,” said the letter. It was signed by Dr. Kathy Lofy, state health officer; Dr. Dan Lesser, chief medical officer for HCA; and Melanie de Leon, executive director of the Medical Quality Assurance Commission. Efforts are under way to increase help for primary-care doctors, including an expansion of UW’s TelePain service, which offers weekly consultations for community and veterans providers. The situation is challenging, but health-care providers across the region and the state are working together, Tauben said. Pain patients shouldn’t panic.